That's me, enjoying my Russian River Publication at Denver's Falling Rock Tap House, the stop for any beer lover visiting the Rocky Mountain State. A great selection of draughts, and the most beer paraphernalia I've ever seen assembled in one place. So here's the back story on Publication. 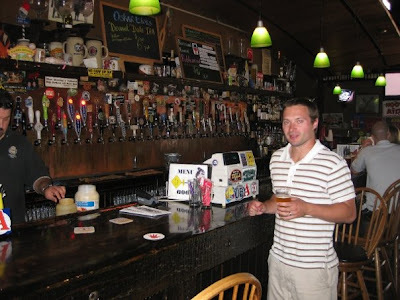 Russian River owner and brewer Vinnie Cilurzo, along with members of beer bars Toronado (San Francisco), Horse Brass Pub (Portland), Brouwers (Seattle), Monk's Cafe (Philadelphia) and Falling Rock Tap House (Denver), formed a brewing group called the Publican National Committee. Publication, a strong saison modeled after Orval, is the PNC's inaugural beer. I'm not sure I have all the details correct, so that's as much as I feel comfortable saying. Now, it doesn't hurt that Orval is one of my favorite beers, so I went in assuming I would like it. And a draught only, limited release beer from Russian River--a brewery whose beers don't make it close to Minnesota? This I could not pass up. The look certainly reminded of Orval: light, sparkling and highly carbonated. Some white grape and other delicate fruits, but the brett smell is the star. Live yeast, that is, for non beer jargoners. I promised to leave out the jargon, but you say brett and beer lovers can smell it instantly. Funky and champagne-like. Easy drinking, especially for the bumped-up ABV. Again, the live yeast hits hard at the finish and is the lasting impression of the brew. A bit tart, sour, and with that lovely sparkle that makes it feel like a classy beverage. I can't say it was better than Orval (though I've had some bad Orval), but I'd love to be able to taste them back to back. Sadly, I don't see that ever happening. This was the last beer I had on our five-day Colorado trip, and I'm glad I dragged the family to Falling Rock before we boarded the return flight.